Cozy Vintage 1960's home in downtown Midwest City, Oklahoma. We purchased this house to live in while building our home. We loved the location and neighborhood so much that we decided to make it a short term rental for those visiting the city on business, vacation, family hospital stays or during a home restoration. 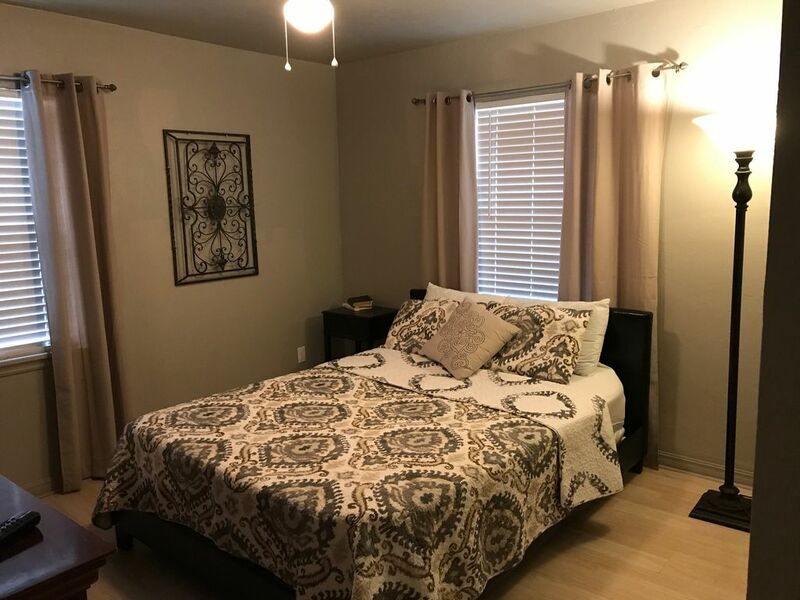 The house is conveniently located only 2 miles off of I40 near Tinker Air Force base, minutes away from downtown OKC and a short drive from Oklahoma University. The home is also safely situated between Regional Park and Kiwanis Park which I would walk to on a regular basis. Somewhat large living room due to garage conversion and 3 bedrooms. Very quite neighborhood as far as activity however, you may hear airplanes from Tinker depending on their training schedule. We affectionately refer to this as "the sound of freedom!" We offer a discount for weekly or monthly rentals. The backyard is fenced and pets are welcome with an additional refundable deposit. We really enjoyed our stay at this house ! Owners are super friendly and it’s in a good neighborhood. The house is very nice and clean! Very clean and great location. The rental was very clean. Very convenient access to the interstate and shopping. Everything worked and all necessary items were provided for a short stay. My family and I were visiting for a wedding and the location worked out great. Owners were very quick to respond to any questions. Would rent again. A quiet neighborhood with easy access to major highways and shopping. The home was very clean and ready for us to settle in for our stay. The kitchen was perfect for preparing meals and storing all the stuff we brought with us. We would stay at this location again. We came to OKC for a long weekend getaway with our kids and Carol did an amazing job making us feel home. The well cared for vintage jewel was exactly as discribed in the posting, was centrally located and easy to find. When we arrived, the house was in perfect order, clean and had everything you will need for your stay. Carol was always in contact before and during the stay to ensure we had everything we need. We truly enjoyed our stay and would come back anytime. Thank you so much for staying in our home. I am so glad that your family enjoyed their trip. I would love to have you stay again. Neighborhood was nice. Golf course and parks nearby. Even a dog park for those that travel with your four legged babies. Centrally located. All the amenities and 3 bedrooms too boot. Thanks so much. We hope you stay with us again. Very nice 1960s style home in a very neat and quiet neighborhood.